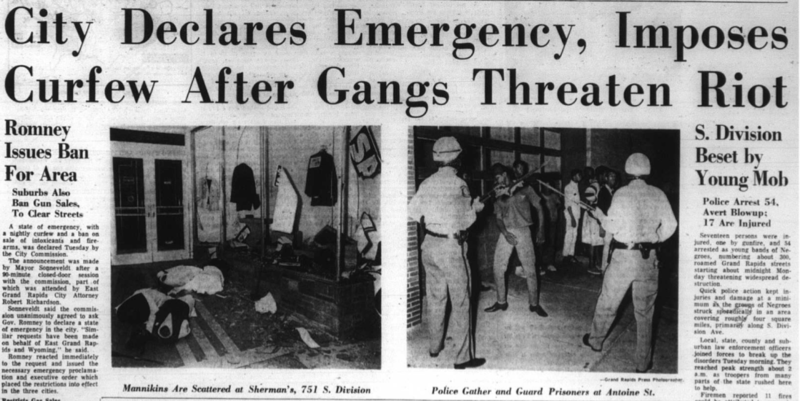 Last week, we posted a 1987 story from the Grand Rapids Press about the 1967 riot in Grand Rapids, where two men who were part of a task force were interviewed about their memories of those three days in late July of 1967. Today, we are posting footage from channel 8 that includes at the beginning a story done by reporters in Detroit during the 1967 riot in the Motor City, followed by footage with no commentary, an interview with the Grand Rapids Chief of Police and an interview with a Grand Rapids Business owner, whose store was attacked during the riot. The footage seems to go back to Detroit briefly, with the channel 8 reporter commenting, then followed again by footage in Grand Rapids without any commentary. There is some footage of people who had been arrested, but no one who was arrested and no one from the Black community was interviewed about what started the three day riot nor what conditions the Black community were living under prior to the riot in late July of 1967. The video footage lasts a total of 11 minutes and 8 seconds and is a good indication of how the riot was reported on by commercial media at the time. This entry was posted in Civil Rights/Freedom Movement and tagged 1967 riot in Grand Rapids, Detroit riot in 1967, TV footage of 1967 riot. Bookmark the permalink.